The CROCO model is used to investigate the coastal upwelling in the south of Madagascar. A new model configuration is implemented. The model reproduces the coastal upwelling system relatively well. The preliminary results indicate that the mechanism of the upwelling system at the South of Madagascar is characterized by the interaction of several key factors: 1) Wind-driven coastal upwelling; 2) Continental shelf and bottom topography, origin of enhancement of the upwelling; 3) Cross interaction between factors 1 and 2; and 4) Volume transport of the current. Five idealized simulation tests are conducted to investigate the primary role of these factors in order to understand the mechanism generating the coastal upwelling,. The simulations thus analyse the respective contribution of the factors that could be identified as the main drivers of the upwelling system. Test 5: Removal of the momentum advection term in the ocean motion equation (Navier-Stokes equation). Test 1 is a realistic simulation which is created such as the state reference for the rest of the test. Test 2 reduces the wind inducing coastal upwelling through a Gaussian distribution method. It is implemented to demonstrate whether or not the variation in the magnitude of the local wind can affect the intensity of the upwelling. Test 3 is the analysis whereby the continental shelf effect is removed by reducing the slope of the seabed topography. Test 4 is the simulation combining the two previous conditions. The last test whereby the advection momentum of the current motion is removed allows to assess the disturbance of the flow motion of the ocean current in the upwelling system. Findings reveal that the presence of the upwelling depends primarily on the intensity of the local wind and the bottom topography. The continental shelf seems to control the location of the upwelling cell in the southeast portion of the upwelling domain. The local wind is the main driver in the rest of the upwelling domain. However, the preconditioning of the subsurface water uplifted by the topography slope is at the origin of the enhancement of the coastal upwelling. The divergence of the southward flow in the east (East Madagascar Current) and in the west (Mozambique Channel flow) contribute mainly to the conditioning of the upper layer of the water stratification to provide a shallow thermocline. The simulations also reveal that the wind-driven coastal upwelling brings subsurface water in the surface layer even if the intensity of the wind is reduced. However, it was also found that the two divergent southward flows (eastern and western boundary current) contribute to enhancing and generating upwelling. During the austral summer the poleward flow in the East Mozambique Channel decreases the intensity of the upwelling. By contrast, the western boundary flow (East Madagascar) contributes to intensify the upwelling during the austral winter. 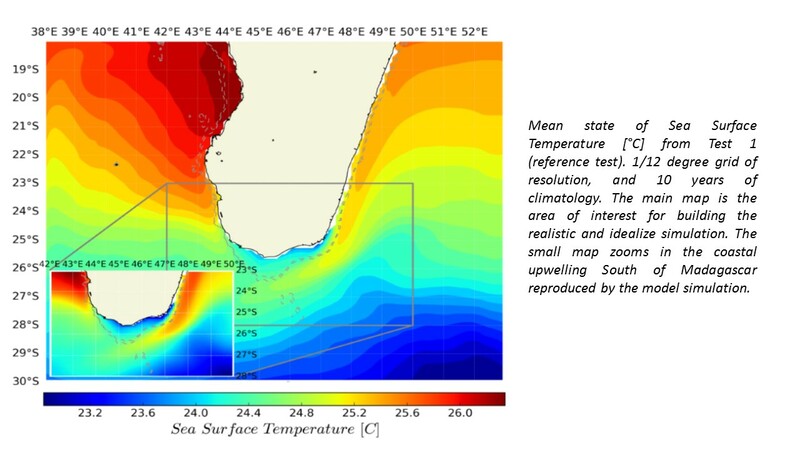 The simulation tests performed in the South Madagascar upwelling system provide confirmation that the coastal upwelling is a wind-current-driven coastal upwelling.